I remember the first time I tried Smoking Loon Cabernet Sauvignon vividly. It was nearly a decade ago on a ski trip with family friends to Maine. My mom and I were browsing the ill-stocked general store in town for a wine that might be passable served with the always-fantastic dinner prepared by our friends (shout out to Mrs. Korolnek if you’re reading this — you’re a big reason I love food and wine as much as I do). Alas, the bottle selection was thin and unfamiliar, so my mom grabbed the first interesting labeled cheap wine she saw: Smoking Loon. I was 16 at the time with a budding interest in red wine, but absolutely zero palate. Nonetheless, I recall not only enjoying this wine, but absolutely loving it. It was a corner stone of my red wine fanaticism, and propelled me to new and great heights. Naturally, after returning to Canada, we kept our eyes out for it — but it remained elusive. Elusive, that is, until recently when it finally hit liquor stores in Ontario. The label was changed (classed up, frankly) and the price raised to reflect LCBO gouging. I was intensely curious to remember whether it lived up to nostalgia. Was it a wine-struck 16 year old flight of fancy? Could it live up to its higher Canadian price? Smoking Loon pours a beautiful clear ruby, perhaps a shade lighter than other Cali cabs you’re accustomed to. On the nose it smells strongly of blueberries (surprisingly so, actually), with a kick of oak and vanilla. As a teenager I remember distinctly its aroma being quite smoky, but that may have just been association with the name. In Smoking Loon’s current iteration the smoke is absent from the nose. That said, it does make an appearance once tasted which was a pleasant surprise (although not nearly so potent as some South African wines I’ve waxed poetic about.) The blueberries are also centre stage, and the oakiness transforms into a sweet vanilla. It’s got a touch of black pepper to keep things interesting. It’s a touch too sweet for my current tastes (makes sense why I loved it when I was young), but doesn’t go overboard. The finish is long, sweet and dry with the tannins making their presence known. 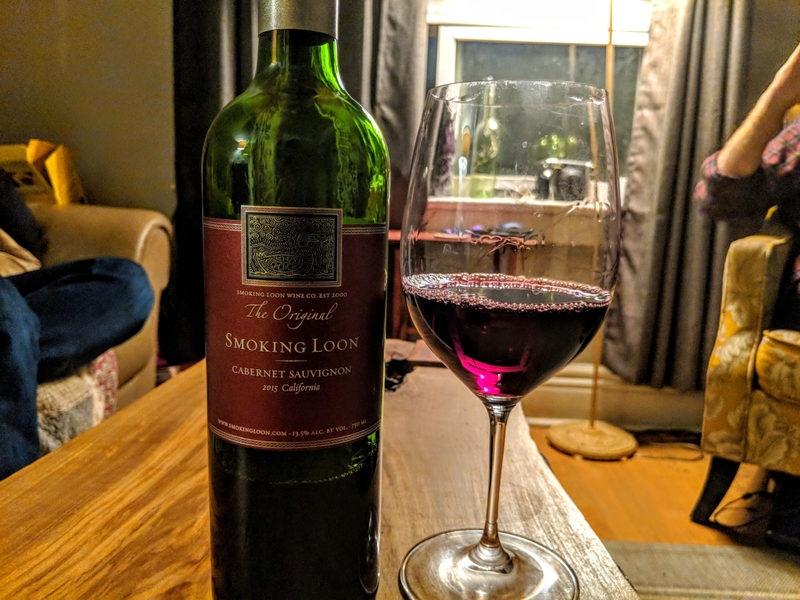 All in all, Smoking Loon is a fine wine in its price range, and will sure to satisfy you even without the nostalgia factor it has for me. Is this wine as transcendent as I thought when I was 16? Arguably not, but it remains incredibly satisfying, and will certainly accompany the next dinner I have with my family and our friends. It’s worth a try now as it was back then, and is definitely good enough to sip slow.